Day 1 – October 26, 2018 – Make your way to Springdale Utah. Check-in to your hotel for the night. If time permits, an afternoon hike through a slot canyon to Kanarra Creek Falls. Day 2 – October 27, 2018 – Wake-up early, have breakfast and make our way to the shuttle pick-up location. We need to be ready to board our private shuttle by 7:30 am with a 8:00 am departure. DO NOT BE LATE OR YOU WILL BE LEFT BEHIND. The shuttle will take us to Chamberlin Ranch where we begin our trek into the Narrows. This is a 16 mile hike with an overnight stay booked at site #12 just above Big Springs. This site is located 11 miles or approximately 8 hours from the trail head. Day 3 – October 28, 2018 – Wake-up make breakfast and pack-up camp. We will continue our hike through the Narrows ending at the Temple of Sinawava. Here we will board a shuttle back to our vehicles at the Zion Visitor center. Hotel accommodations are booked in Springdale, Utah. Located approximately 1 mile from the parks South entrance and meet-up location. Room rates are $204 per room with a maximum occupancy of 4 per room. Breakfast is included with your stay. The Narrows overnight hike will be $75 per person. This covers your back country permit, camp site & shuttle to the trail head. There is a group size of 12 people max. Please leave your pets at home!!! 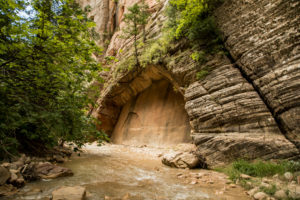 This is a 16 mile hike through a slot canyon and river in Zion National Park. The campground reserved is site #12 located just above Big Springs, or 11 miles into the 16 mile long journey. The water will be cold, roughly 50 degrees, so plan accordingly. The temperatures generally range in the 70’s during the day and the 40’s at night in October. The Narrows are much cooler as the slot canyon receives very little to no direct sunlight. Wear sturdy shoes!!! The hike through the Narrows requires a lot of balancing on slippery algae-coated rocks. Canyoneering boots with good ankle support paired with neoprene socks are highly recommended. Inappropriate footwear often results in crushed toes or twisted ankles. Bring a good wooden hiking stick!!! A good sturdy hiking stick will help tremendously with keeping your balance while hiking through the river. Trekking poles are not recommended as they tend to get caught between the rocks on the bottom of the river and pull apart or break. Clothing, the Narrows can be cool and breezy so be sure to bring warm clothing to layer up in and a change of dry clothing, especially for at night. The temperatures can drop down into the 40’s or even upper 30’s. Wool and synthetic fibers work best, avoid cotton. Hypothermia in the back country can be serious!!! Wearing dry pants or a wet suit is advisable. 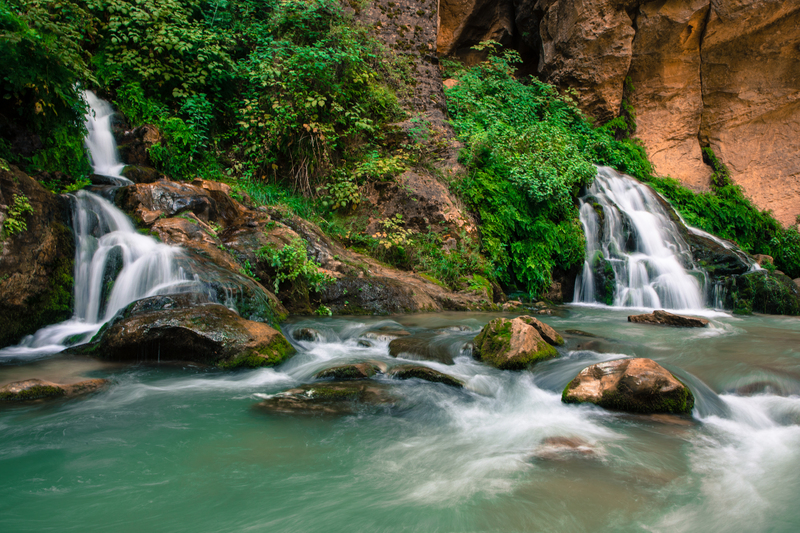 There are several places in the canyon where water tends to be deep and may require a short swim. It is advisable to bring a small raft to float your pack through these sections.